The Eaton Comfort 1000 has 1000 MyPro-Pocket Springs - the pocket spring system is the best at providing individual support to the sleeper. The upper layer of springs shape to the body contours while the lower layers absorb changes in weight distribution for the ultimate comfort and support. MyEdge Support gives a unique firmer outer spring support on the sides of your mattress that will prevent rolling out of bed and maintains the mattress in perfect shape. A dust free white fibre filling is added to the mattress to provide softness and resilience. White fibre is formed into a deep layer for guaranteed quality and softness. Mattress is upholstered in a soft knit cover that has a quilted sleeping surface and mattress borders to provide soft cushioning and added comfort. There are handles on both sides of the mattress for ease of positioning. 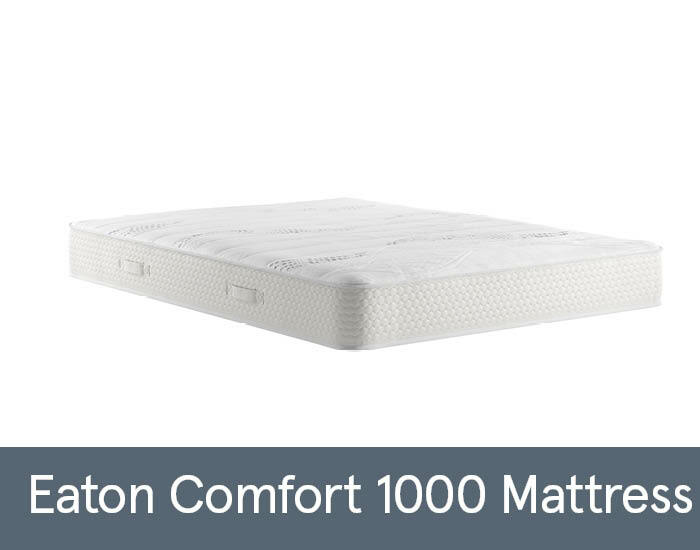 The Eaton Comfort is an Easy Care Mattress, so there is no need to turn, but regular rotation from head to toe will extend the mattresses life span.